Wholesale partners say company has 'Qwestionable' motives. Denver-based Qwest Communications announced July 22 a new “Heavy Duty” Internet service that will offer customers 40-megabit per second, super-fast download speeds. Meanwhile, some of Qwest’s wholesale partners who sell Internet service to homes and businesses through Qwest’s infrastructure are allowed to sell their customers no more than 1.5 megabits per second. That’s led to accusations that Qwest is anti-competitive and pursuing monopoly control of broadband Internet in some Utah markets. Ashdown accuses Qwest of lying to his customers and purposefully manipulating their network to put companies like his in a permanent state of inferiority. For example, he says Qwest representatives have told his customers that XMission is technically incapable of offering the 40-megabit service, which Ashdown says is an “outright lie.” Indeed, his company offers fiber-optic-speed Internet service through UTOPIA, a municipal network currently available in 16 Utah cities. “We’ve had the exact same experience,” of Qwest lying to their customers, says Lee Livingstone, the CFO of Orem-based Fibernet. The complaints stem from the long-term impacts of the Telecommunications Act of 1996. In the 1990s, home Internet service was provided via telephone lines, a public utility with regulations that demanded fair play to promote competition. Brothers Lane and Lee Livingstone, the CEO and CFO of Orem-based Fibernet, say that act was intended to spur more competition by reducing regulation, but in practice the act has had the opposite impact on the broadband market. Largely, that’s because it’s economically unfeasible for most companies to lay wire connecting homes to network servers. Here’s how it works: Since the inception of DSL earlier this decade, Qwest has rented out portions of its infrastructure to companies like XMission, Fibernet and others, who then provided their Internet service to consumers over Qwest’s wires. Customers always pay Qwest for use of the wires even if they get their Internet from a third-party Internet-service provider, or ISP. Qwest offers its own Internet service, however, and customers who choose that option pay Qwest for both the use of the lines and Internet service. In recent years, Ashdown and the Livingstones say Qwest has been taking advantage of the deregulated environment to poach their customers, often using deceit to do it. Ashdown posted to his company’s blog a recorded telephone conversation that contains a woman, allegedly a Qwest sales representative, telling a male customer that one particular residence would be forced to switch from a third-party provider to Qwest Internet service in order to upgrade to the latest, greatest service. 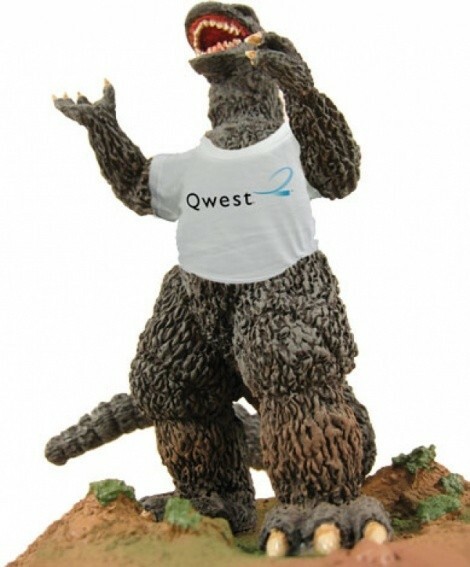 “So, Qwest is trying to eliminate the competition?” asks the man. “In a way,” the female replies. Sandy blogger and “professional computer nerd” Jesse Harris called the recorded message “a smoking gun” that confirms Qwest “isn’t playing fairly.” At FreeUTOPIA.org, Harris writes favorably of municipal fiber-optic networks like UTOPIA. Those are the only entities that can effectively compete with corporate giants like Qwest and Comcast, he says. Qwest spokeswoman Nikki Wheeler did not deny the accuracy of the information in the telephone recording. Instead, she said the recording might be fabricated or edited, but nevertheless refused to comment on the accuracy of the information, citing customer privacy. She said it’s “economically unfeasible” for Qwest to allow third-party providers to offer the 40 megabit service and declined to elaborate. Meanwhile, Qwest has paid $270 million in dividends to investors in 2010 alone, cash that goes from the customers’ pockets to the pockets of Qwest’s investors. Ashdown says that profit should be used to expand broadband throughout the state or to reduce prices to customers, “but they’re more worried about their shareholders,” he says. Ashdown has discussed the issue with attorneys, but was told there are no issues to litigate. The Livingstones say they stopped complaining to the U.S. Federal Communications Commission about perceived unfairness from Qwest years ago because nothing ever came of it. Instead, they’ve mostly abandoned the residential DSL market, an example of deregulation reducing competition, they say. Ashdown complains that federal lawmakers have failed to enact laws that would foster fair competition between relatively small companies like his and "incumbent” companies like Qwest that grew to their giant sizes during the days of regulated monopolies and have maintained their gargantuan size even as the lawmakers lifted the regulatory yolk from their necks. While Qwest may be inching toward a monopoly on DSL services, it still faces competition from cable operators like Comcast, wireless services, and municipal fiber-optic networks. Customers dissatisfied with Qwest can switch to a competitor, but many areas of Utah have only one broadband service provider, or two. Harris was spurred to start his blog when he sought out UTOPIA services, but wasn’t able to receive it in White City. Internet infrastructure owners are also at the heart of concerns about “net neutrality,” an issue Ashdown and the Livingstones see quite differently. Ashdown, Harris and others worry that unless all companies are required to treat all Internet traffic equally, infrastructure owners could block some content—provide Fox News but block MSNBC, for example—or favor corporate-produced media generally over homemade YouTube videos. They support proposed federal legislation that would force Internet companies to treat all traffic equally. The Livingstones, however, oppose net-neutrality legislation. So long as ISPs are able to operate in a fair, competitive market, they say, customers can simply switch to another company that does not block the content they want to receive. Very few companies can build their own broadband networks, which entails digging up roads and laying wire. The Livingstones says some companies have made forays into building their own infrastructure in business neighborhoods, but only companies with the financial heft of Qwest can afford to build residential networks. As an example, Harris says, look at the financial difficulties that have faced UTOPIA, an agreement between 16 Utah cities to build their own fiber-optic network that any third-party ISP can use. If 16 cities combined have trouble building a fiber optic network successfully, Harris says, what chance do small private businesses have? Founded in 2002, UTOPIA is currently seeking $60 million from its member cities and has faced ample criticism, mostly over cost. Fourteen ISPs, including Xmission and Fibernet, provide services to customers in member cities, which include West Valley, Murray and Midvale. But, the Livingstones say, without competition from municipal networks, Qwest wouldn’t even offer its 40-megabit fiber-optic network service.